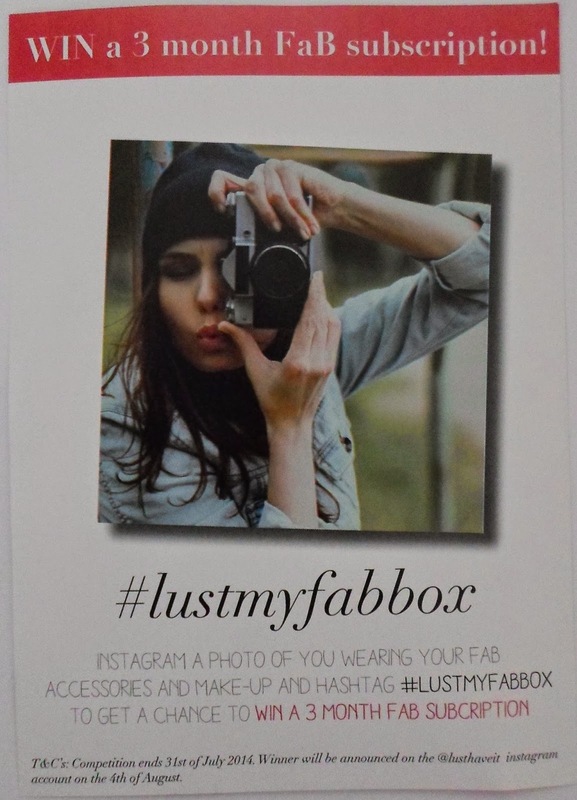 Second subscription box to arrive this month is my Fashion and Beauty (FAB) box from Lust have it (LHI). In this box you get 5+ beauty products and accessories each month, from what I’ve seen the beauty products tend to be full size. For this box there are several subscriptions choices: introduction bundle, monthly, quarterly box, annual subscription. I have the monthly subscription at $35 per a month. It seems that there is only one variation of the FAB box each month, though sometimes product colours differ. Find out more at Lust Have It. Over the next month there is apparently an Instagram photo contest where subscribes can enter by uploading a photo wearing Fab products. Doesn’t say whether is has to be from this box or not. Either way I’m not likely to enter. Here is this months product card. LHI gave us a sneak peak of this product and said there would be two more from this brand. I actually cancelled before hearing this, but then resubscribed. I’m really glad I ended up getting this box. For me packaging is a big selling point for any item and this lipgloss is beautifully packaged (as is the whole range) This lipgloss is clear with a golden shimmer/glitter through it and has a sweet fruity fragrance, which I still can’t identify. The brush allows for precise application and I find the gloss has a nice consistency, gives a good shine and last really well. It actually lasts better than any gloss I’ve tried for a long time. Do not that this is a volumizing lip gloss and does give a slight tingle to the lips. Well I’ve got to say that I now have a new favourite eyeliner. This eyeliner is once again beautifully packaged and is a mechanic style wind up pence with a smugger and sharpener on the end. But don’t be fooled this is not just another black eye liner; this black eyeliner has little flecks of bluish ‘micro’ glitter. This glitter catches the light beautifully to give of a flash of colour without being over the top. 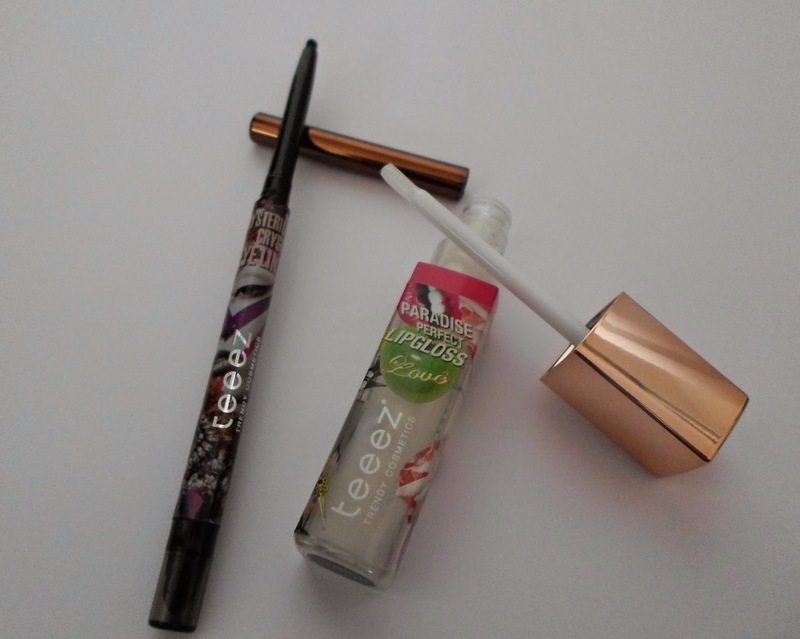 This eyeliner glides on smoothly, yet is firm enough to be sharpened to a point. Allowing for a crisp line, or it can be blended out with the inbuilt smugger. More wonderfully after 45 seconds the eyeliner will set, becoming water and smudge proof. 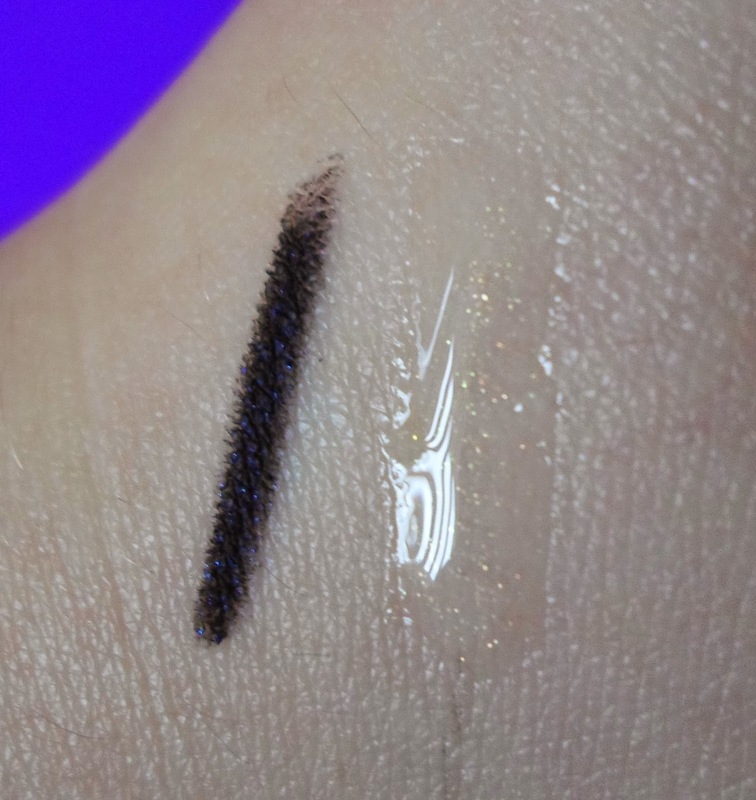 For me this is important as eyeliners instantly transfer into my eyelid crease. This is a nice foundation brush with a pretty print on the handle. When it comes to makeup I'm a brush kind of person and I will happily add this to my collection. The bristles are natural goat’s hair and feel quite soft. I have yet to use this brush so I can’t really say how it will perform, but I have a good feeling about it. 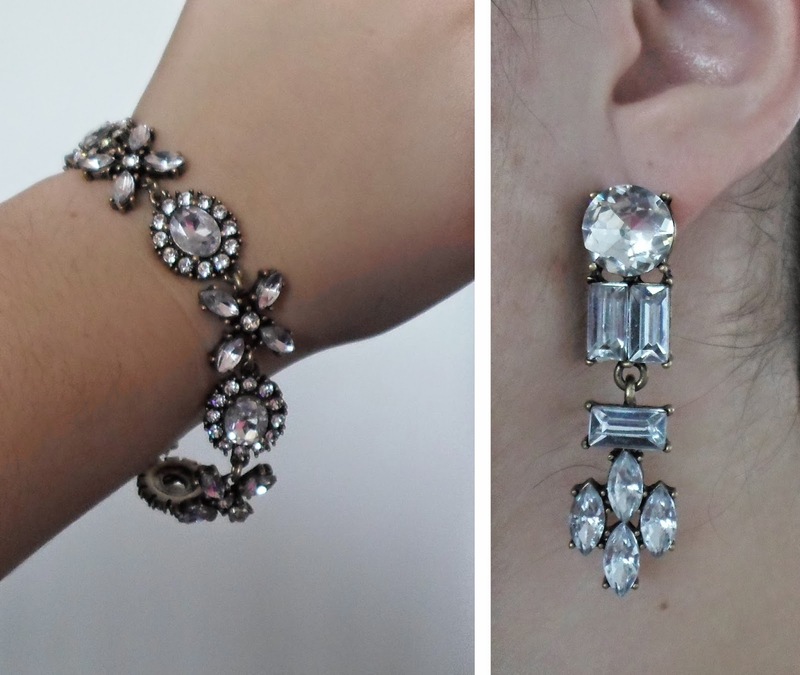 Obviously chosen to match the bracelet, I feel that these earrings are not as nice. These seem the gems are a little more chunky and don’t catch the light as nicely as in the bracelet. These earrings are also a little too heavy form me and don’t really suit my glasses (a constant problem for me). As much as I like the bold lip look these might be a bit too much for me. 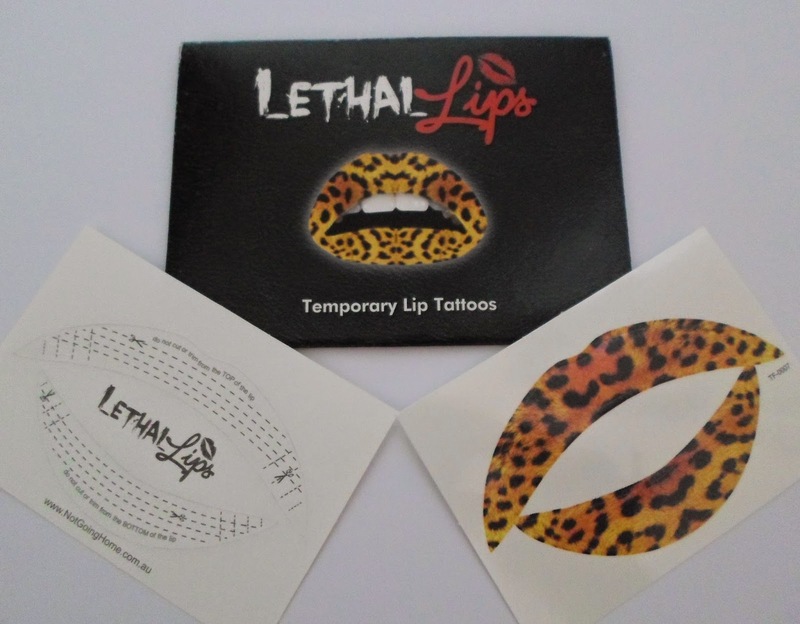 However I do understand that temporary lip tattoos are having a moment of popularity so it makes sense to include them. Maybe I would feel more enthusiastic if I had gotten the red or pink set (the colours I normally ware on my mouth). These are meant to be trimmed to your lips and then applied much like those old schools temporary tattoo you may have used as a child. I can imagine that it would take a bit of practice to get right and I am a bit curious about how they would feel on. I paid $35 for this box and the contents is valued at $145.90. I’m really impressed with the beauty products in this box and also like the bracelet, so I fell that I got over my money’s worth on this box. I have been subscribed to FAB box for two months, but this is my third as I started with a bundle. As I said above I did actually cancelling before seeing this month would include Teeez products. I’m am still thinking of cancelling my FAB box and subscribing to Violet Box instead. Though I love the beauty products, I feel that the accessories don’t match my style and truthfully I’ve not been that impressed with the jewellery in the FAB boxes. I personally feel that most of it is over the top and overpriced. I’m also a bit cautious about what this jewellery is made of. The other day on face book I asked if “the jewellery in the FAB boxes is hypoallergenic/ nickel free?” and got a response telling me “best to assume that it's not… Please email me at support@lusthaveit.com if you want to discuss.” So if you do have problems with metal allergies do take care with these products. 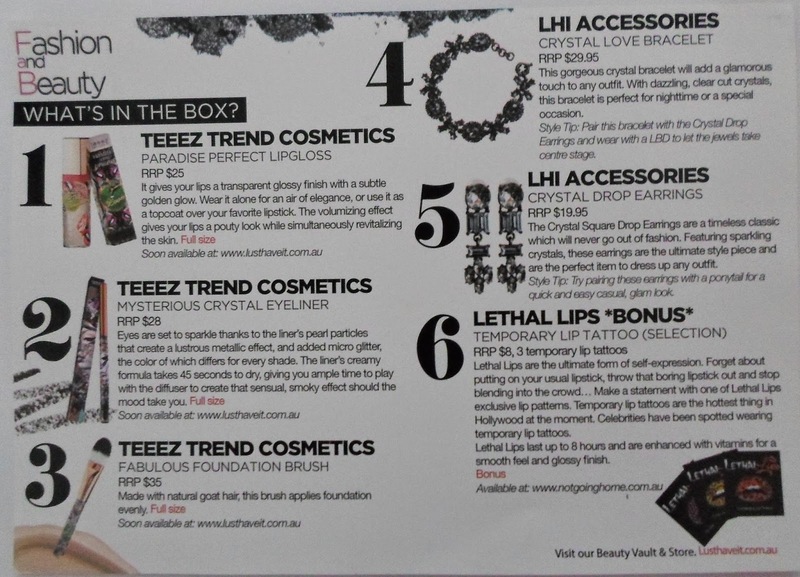 Do you subscribe to LHI’s FAB box? 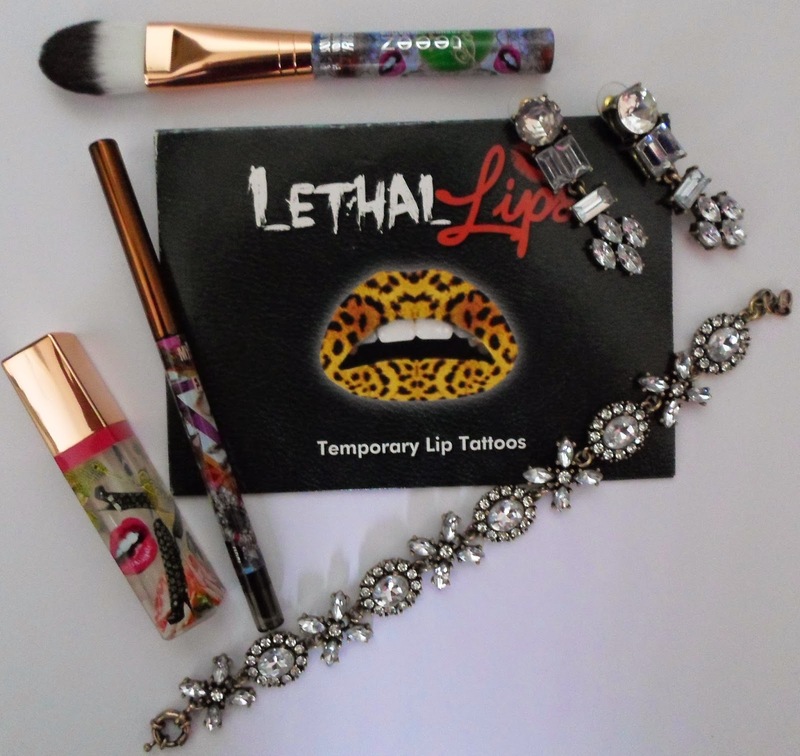 Tell me what you think of this month’s FAB box. I am finding that the load of products can be a bit much, but as I’ve only been subscribing to boxes for four months now I’m still thrilled with them.